Windows 8 comes with many new features and improvements, on of the improvement is new Lock Screen, It comes with new background and a new way to bring logon screen. If you had allowed to run applications in background then this new Lock screen will also shows you notifications from background running apps. TuneUp IncrediLock is a nice app which allows you to put sticky notes on you lock screen. You can put any of your customized note on your lock screen and then it will be shown with other notifications. This app can only works if you had set wallpaper from it, it has tons of wallpaper and you can choose any of from it. 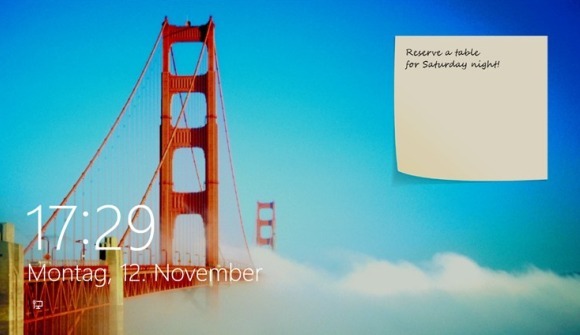 Widget will be shown on your lock screen and it will remind you regarding the task for which you had set sticky notes.